Reduce Marketing Spend and Increase Profits. In today’s video I talk about why many people are wasting a lot of time and money on their marketing by not taking two simple Steps. Step 1. Create your Unique Position in the market…. Be seen as a leader and authority. Step 2. Package your products, programs or services different to your competition i.e. Design your unique (outcome based) signature system. When you are seen as different and your products and services are packaged as a unique solution, you will save time, effort and money. One of the most powerful was to do that is with a book. 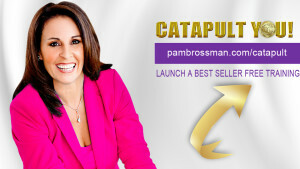 Pam who if you don’t already know is 10 times #1 Best Selling Author, Creator of the Best Seller Impact program and has helped over 60 Authors publish 100 Best Selling Books. Has some FREE VIDEO TRAINING on how to write and publish your book in just 8 weeks. I recommend you check it out.